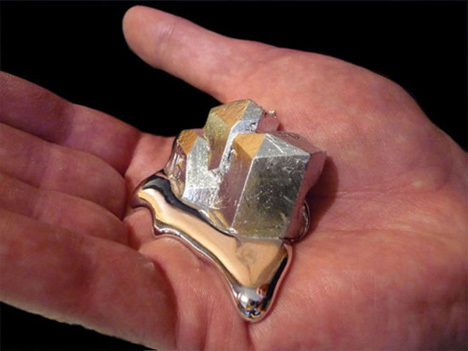 There is an incredible metal that shatters like glass, melts in a human hand, attacks other metals but is non-toxic to humans, and acts like an alien life form when exposed to sulfuric acid and dichromate solution. It sounds too amazing to be true, but gallium is an absolutely real chemical element that’s found in some of the gadgets we use every day. But perhaps more interestingly, there are a ton of insane experiments scientists like to do with gallium. Thanks to its odd properties and behavior, gallium can do some pretty strange things in the lab. The above video shows what happens when gallium “attacks” aluminum. The “gallium beating heart” experiment is a popular one that shows how gallium can act like a living thing when submerged in sulfuric acid and a dichromate solution. By altering the surface tension of the gallium, the scientists are able to make the metal look like an organic beating heart. The melting gallium spoon is a fun demonstration that makes good use of gallium’s 85 degree (F) melting point. A gallium spoon stirs hot water and immediately melts into a puddle on the bottom of the mug. The video above warns against using it for pranks, but we have to admit it would be really, really hard to resist. See more in New Materials or under Science. July, 2011.